It was a 24th birthday to remember for West Linton’s Gemma Batty, as she was crowned the Scottish Women’s Amateur Champion at the first time of asking at The Golf House Club, Elie in Fife today. In a closely fought match against Craigielaw’s Gabrielle Macdonald, the game was all square going down the final hole. First to play her approach to the green, Batty produced a fine second shot to 15 feet. Then, from a slightly awkward lie, Macdonald struck a solid approach which took a cruel hard bounce finishing up out of bounds behind the green and Batty won the match by one hole. Batty is the first player to have won both the English and Scottish women's amateur titles. She won the English championship while she was waiting to become eligible to play in the "Scottish." Batty, originally from Leeds, moved north of the border with her family four and a half years ago and the University of Stirling student represented Scotland for the first time at last year’s Home Internationals after patiently waiting three years to do so under the residency rule. “The key to my success this week was my ability to hit fairways and greens. The rough is quite lush out there and it’s hard to control the ball going into the greens, so I put myself on the fairways and gave myself the best opportunity to put it close. In yesterday’s semi-final, Batty stormed to an impressive 5 and 4 victory over the 2016 champion Ailsa Summers (Carnoustie Ladies) after defeating Minto’s Tara Mactaggart 3 and 2 in the morning quarter final. 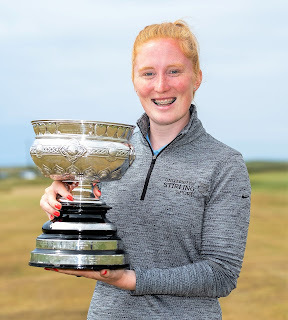 Today was Macdonald’s third final appearance in five years and the Craigielaw member showed real mettle on her route to the final, taking out the in-form Welsh and Irish Women’s Open Champion Hannah McCook at the third extra hole in the semi-final, straight on the back of beating top qualifier Chloe Goadby on the fifth extra hole in the morning session.